Every now and again a novel comes along that totally seduces me and I find myself reading it more slowly than normal so I can absorb every little detail and nuance, and really get inside the characters. That happened to me with this book, so much so that it has taken me over a week to read it. At 500 pages it is of course a thumper of a novel but the size wasn’t the reason for the slow read, rather it was the vast array of interesting characters, and the wonderful descriptions of life leading up to the American Civil War and the years that followed, arguably the most tumultuous period in the history of the United States. 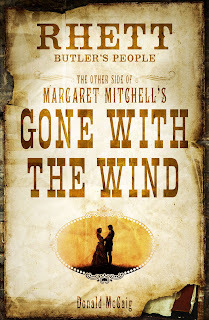 And of course it is both a prequel and a sequel to Margaret Mitchell’s revered, Pulitzer prize winning, 28 million copy 1935 best-seller, Gone with the Wind. It covers the years 1843 to 1874 (20 years more than covered in GWTW) and begins by revealing Rhett Butler’s childhood years when he was reared by a stern and unforgiving father, years which hold the key to his rebelliousness that we came to know in Gone with the Wind. As the story progresses all the major characters and some of the famous scenes from Gone with the Wind are featured, all from the perspective of our maverick and dashing protagonist, Rhett Butler. And what a story it is. Rivetting. Donald McCaig is not a name much known in New Zealand but a little research reveals that he has several highly-rated American Civil War novels to his credit including Jacob’s Ladder which the Virginia Quarterly rated as “the best civil war novel ever written”. High praise indeed as there have been hundreds of civil war novels. That book won The Michael Shaara Award for Civil War Fiction and the Library of Virginia Award for Fiction. So he was the right man for the job. His new book was written with the full cooperation of the estate of Margaret Mitchell and took McCaig some 6 years of researching and writing to complete. The result is a fine novel with great characterization and powerful narrative. It has been worth the wait. The book was published simultaneously throughout the English speaking world on 14 November. Gone with the Wind was of course made into an equally famous movie featuring Vivien Leigh and Clark Gable. I wonder who will play the roles of Scarlett O’Hara and Rhett Butler in the movie version of Rhett Butler’s People because there is nothing surer than there will be a movie to follow. Bring it on I say! Footnote: This is a stand alone book and you do not need to have read Gone with the Wind to enjoy it, not at all, but oh it is so much more fascinating and satisfying if you have read the earlier classic.